There are still some magazines out here using illustrators for covers. 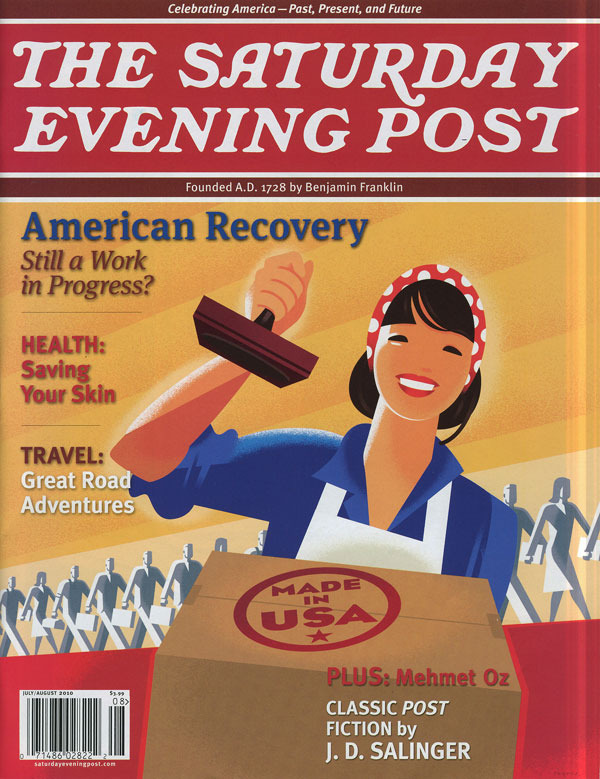 The Saturday Evening Post called for an image to accompany an optimistic article about the American Economic Recovery. They had the idea of an updated Rosie-the-Riveter-style worker with a big “Made In America” rubber stamp. Even when a client has a clear idea of what they want, I’ll try sending over some other concepts too, to look at some other options and maybe move the idea forward. The silhouetted figure filled with industrial scenes was too focused on building, and the Jean Carlu glove idea didn’t fit the article or the Post’s brand as well as the smiling Rosie with a row of workers marching forward. So, my main task was to re-create a classic WPA poster style, sometimes style and concept are the same thing. I didn’t know the issue was on the stands until my mom called to tell me a friend of hers bought a copy at the grocery store and spotted my name. For a minute there, I felt just like Norman Rockwell. Nice job Norman! I love your balance between solids and graphic shapes. Right man for the assignment. The center sketch looks like a classic as well. You've always been so strong with the crafting of your illustrations. Nice piece, Paul. I really like how you edited the facial information.God, I sound like a robot. Really nice work Paul, glad such a venerable showcase was smart enough to put you up there alongside the greats. what a beaut. i noticed the production "glove/ wrench" from your studio! Strong cover Paul! So they also went with the old style logo right? 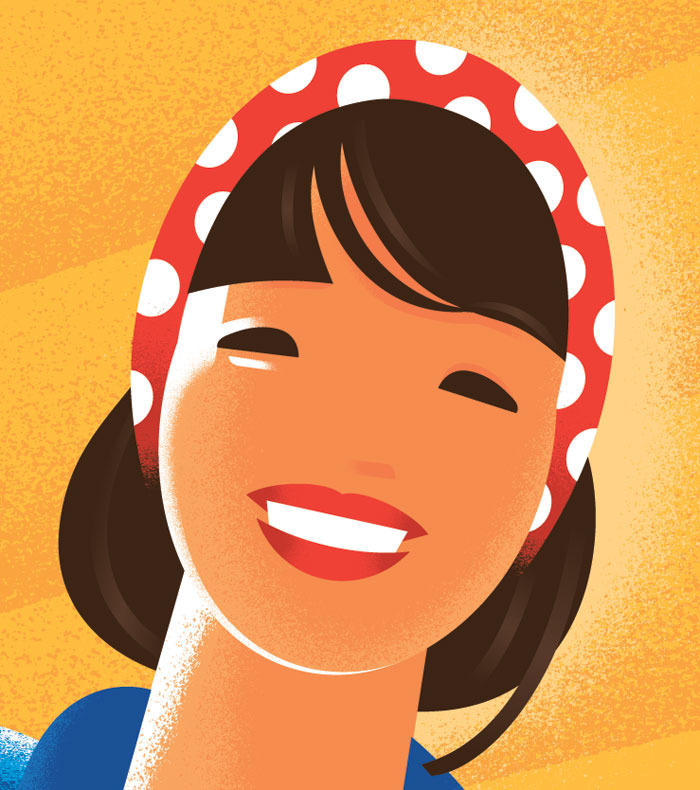 (im out of the loop on current logos, sorry) Funny thing is that the lady could be seen as Oriental, giving it a whole new twist. So classic looking. I really love this. I should probably be embarrassed by this, but until your post I wasn't aware the Post was still in print. btw, I live a few blocks from it's original home in the Curtis Publishing Building. A perfect cover, Paul. Thanks for MCing at ICON - you and Brian were great! You've got just the right period flavor, Paul, nice job! You are the right man for the job! This is so great Paul. It's exactly how you would imagine it to be. Why is she wearing a mask? I like it but it's weird.